There is a long golden stretch of sand on the Sunshine Coast called Mudjimba Beach. 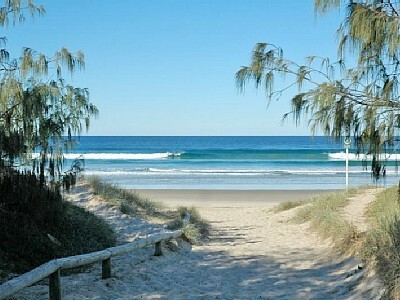 It runs from the mouth of the Maroochy River right up to Point Arkwright, a distance of some six kilometres. Like all beaches it hides one of the great mysteries of the universe right out in the open. As a resource for exploitation beaches present an abundant supply of stuff. There is sand that can be carted off in trucks by certain interests in the mining industry for such things as silicon and apparently gold which has jumped up in value lately. Then there is the foreshore, and what a goldmine that is! Everything from townhouse developments and blocks of flats to resorts and golf courses. These things in turn drive endless commercial opportunities for the conveniences and luxuries so beloved by holidaymakers and tourists. Cafes, restuarants, boutiques, kebab shops, wine bars, pubs, beauty salons, surf shops . . . the list goes on. People flock down to the beaches for all kinds of recreation. Note the construction of the word recreation, literally RE-creation, for recreation is based on the idea that human beings can re-creae themselves, just as the word spelling is based on the ancient understanding that the construction of meaning using symbols is a powerful form of magic. We can invoke worlds with symbols – it’s called reading and writing. And we can RE-create ourselves in the temples of nature. Now we live in such an advanced age and we live in such an advanced society, that people sauntering along an ocean boulevarde by the sea cannot fail to comprehend that fish & chips can be purchased for only $7.95 with extra sauce for only 50 cents. Milk shakes are $4.50 and real barista coffee is only $4.20 for a large mug. Here then is an abundance of resources and thanks to the magic of the written word and the enfolded brain we have been able to organise ourselves to take part in its bounty. But what of the secret life of beaches? For it is one of The Great Mysteries. According to the ancients of various traditions the elements are Earth, Air, Fire and Water. But are not the elements described within the scientifically amazing periodic table? If one kind of RE-creation is to slather youself with blockout and laze on the sand perhaps authors with vivid imaginations and amazing stories are called to draw upon the possibilities of a new kind of story at The Temple of The Golden Sands. Simple ambitions may drive men to form the environs of the seashore for pieces of gold and sliver and this may even prove successful to a point. But the scratches of graffiti that man makes upon the sand will be quickly washed away by the eternal ocean, leaving us with the purest elements of Earth, Air, Fire and Water. You may ask: Where is the element of Fire at the Temple of Golden Sands? When the sun rises and when it sets the four elements are said to be present. Have you noticed that time of magical recreation at the beach? If you were to cast a spell at the Temple what magic symbols would you use to write upon the sand? Perhaps you would declare to the universe: I experience my genius daily . . .my heart is filled with gratitude and abundance . . . Love is the answer . . .All are deserving but few are willing . . .Life overflows with opportunity. But what is the key to activating miracles at the Temple of The Golden Sands. It seems we have an abundance of resources at our command. And we do. The answer is surely one of the great mysteries . . .TRUST. Thanks for the succinct and artful expression Dr Quantum … a good read.